Step 1. Ensure you have ordered your rolls from www.tillrollwarehouse.co.uk. Before you begin the process please be sure that you have the correct size roll to ensure that you do not damage the credit card terminal itself. The ‘cradle’ or printer compartment in most machines are specifically designed to take a 57mm width roll and 40mm max diameter. Some machines can take slightly different sizes but If you are unsure about the size of roll you require go to the home page on this site and enter the machine name and model in our easy to use roll finder tool, or pick up the phone and call us free on 0870 850 6535 where our friendly team of experts are waiting to help you. 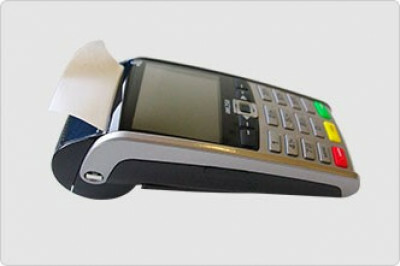 Pick up your card machine with one hand (the machine does not need to be disconnected) and using your other hand lift and open the printer cover at the back of the machine. 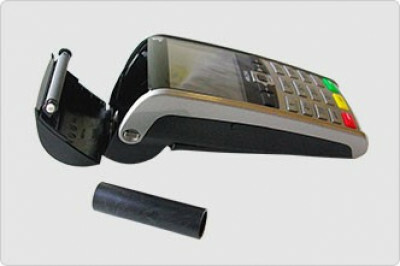 Pull out the plastic or cardboard core from the card machine cradle and dispose of it in the recycling. Remove the replacement roll from the box and peel away the end of the paper (this is normally held in place by a low tack glue or small label) Carefully place the till roll into the printer compartment (also known as the cradle) of your card machine. Remember, the end of the paper roll must face upwards and point away from the keypad. Pull out a small length of paper from the roll and hold the end of the till roll up, the printer cover can then be closed so that it is correctly positioned and sticking out. Push the printer cover firmly until you hear the lock click. 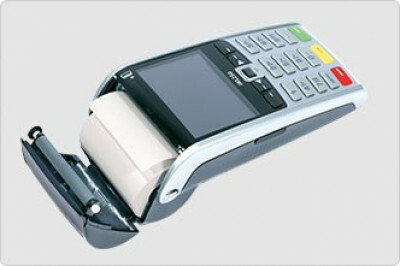 When this is complete check your credit card machine display, your card machine should display ‘READY’. Press and hold the ‘CLEAR’ button to check the paper feeds through smoothly and does not jam or get caught. You are now ready to resume trading! Should you have any questions or are experiencing any difficulties in changing your roll do not hesitate to contact us for friendly and expert advice and support.